An aortopulmonary window (APW) is a rare cardiac malformation, first reported by Elliotson, is found in 0.1% of patients with congenital cardiac lesions. In most cases, surgical repair is undertaken during infancy although isolated cases have been reported of transcatheter device closures. We report our experience of transcatheter APW closure via antegrade and retrograde methods using a novel device Amplatzer duct occluder II (AGA Medical Corporation, MN, USA). A 6-year-old male weighing 18 kg presented with a history of frequent respiratory tract infection since early infancy was diagnosed to have an isolated 4 mm restrictive Type I APW with continuous left to right shunt with early diastolic flow reversal in arch of aorta. Access was obtained in the right femoral artery and vein. APW anatomy was best profiled in ascending aortogram in cranial 30° view [Figure 1]a, measuring 4 mm and far away from origin of the left coronary artery. Mean pulmonary artery (PA) pressure was less than half systemic. The lesion was crossed retrogradely with 0.025 cm × 260 cm J tip Terumo wire through 5 Fr 3.5 mm right Judkin's catheter. Since there was difficulty in negotiating the catheter into the defect directly in retrograde method we decided to go for antegrade method. An arterio-venous loop was formed by snaring in the left PA using 10 mm gooseneck snare [Figure 1]b. A 5 Fr Launcher Catheter (Medtronic, USA) was advanced across the defect into descending aorta from venous end. A 5 mm × 4 mm ADO II device was deployed across the APW under transthoracic echocardiographic guidance. 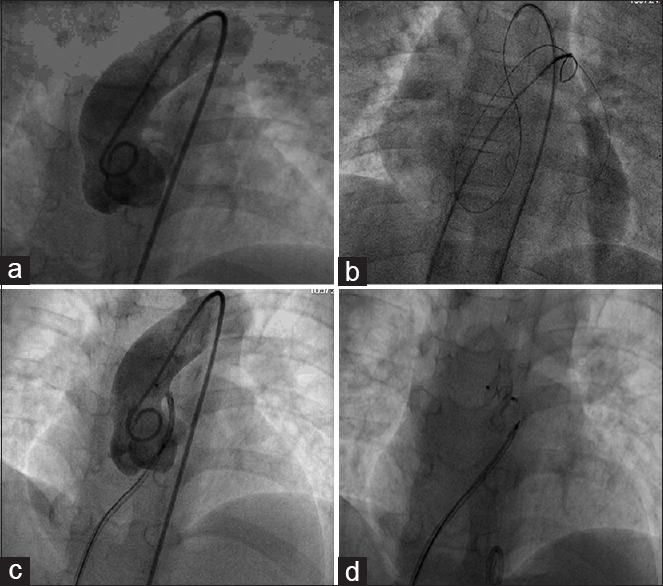 Check angiogram showed complete occlusion of the defect without impingement of the left main coronary artery [Figure 1]c and then, the device was released [Figure 1]d.
Another 2-year-old female weighing 10 kg presented with the incidental detection of murmur and was diagnosed to have a 4 mm restrictive Type I APW [Figure 2]a. Mean PA pressure was less than half systemic. The lesion was crossed retrogradely with 0.025 cm × 260 cm J tip Terumo wire through 5 Fr 3.5 mm right Judkin's catheter. A 6 F Launcher catheter was advanced over the wire retrogradely and placed in the right ventricle (Though 5F launcher catheter is compatible to deliver the device, due to unavailability of the catheter in the laboratory we had to use 6 F catheter). 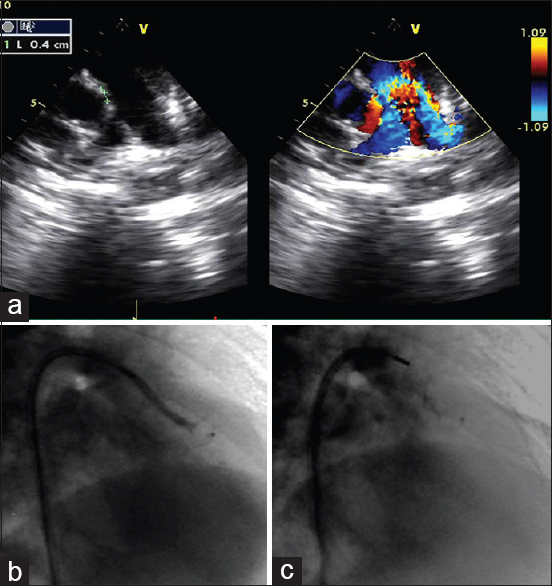 A 5 mm × 4 mm ADO II device was pulled from RV [Figure 2]b and deployed across the defect [Figure 2]c under fluoroscopic and transthoracic echocardiographic guidance. The size of the device was chosen according to table T2 of ADO II booklet with a smaller waist length due to the absence of an aneurysm unlike patent ductus arteriosus and ventricular septal defect. To the best of our knowledge, there is only 1 case report of a similar device being used successfully in a postsurgical residual APW. Although there is no consensus regarding the type of device used, we found the novel device ADO II more suitable because of two equal retention discs on either side which gives an added advantage for retrograde closure of APW with a low profile arterial sheath, especially in small children. There was no evidence of hemolysis, supravalvular obstruction in great arteries, or any residual shunt in either of the cases on 1 and 2 years of follow–up, respectively. We would like to acknowledge Dr. Md Asghar Ali (MD, Pediatric Cardiology Registrar), Suvendu (Secretary Pediatric Cardiology). Elliotson J. Case of malformation of the pulmonary artery and aorta. Lancet 1830;1:247-50. Noonan PM, Desai T, Degiovanni JV. Closure of an aortopulmonary window using the Amplatzer duct occluder II. Pediatr Cardiol 2013;34:712-4.